Along with destroyed beaches and water-logged houses, Hurricane Sandy also took a toll on our wildlife, like grounding this majestic Turkey Vulture. 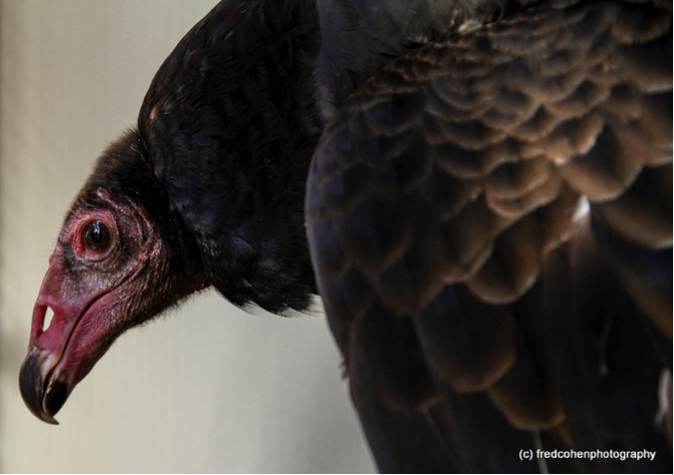 The Turkey Vulture (Cathartes aura) is native to New York, living successfully near humans by feeding on roadkill and garbage. This valuable clean-up service reduces the spread of salmonella and botulism, which they don’t contract; in fact, their highly acidic stomachs destroy most bacteria. You will often see turkey vultures soaring high on thermals searching for prey, which is probably how this bird got caught up in Hurricane Sandy. He was brought in to the Wild Bird Fund Rehabilitation Center in Manhattan ten days after the storm with a broken wing. We were thrilled to be able to come so close to one of the largest raptors in North America. Despite their reputation, turkey vultures are gentle and non-aggressive, and our patient was a joy to have in the center. While his cage was being cleaned, he even liked to look out the window at the traffic on Columbus Avenue. He was fed fresh meat, which they prefer to old carcasses, and given an x-ray. The x-ray revealed bad news: his damaged wing bones had already fused, so his future was grim. He would never be able to fly or soar again, and could not be released. Despite the bad prognosis, our patient was healthy, strong, and still able to hop and flap up to five feet, making him an excellent candidate for life at a bird sanctuary. Luckily, someone had been waiting a long time for just this opportunity. 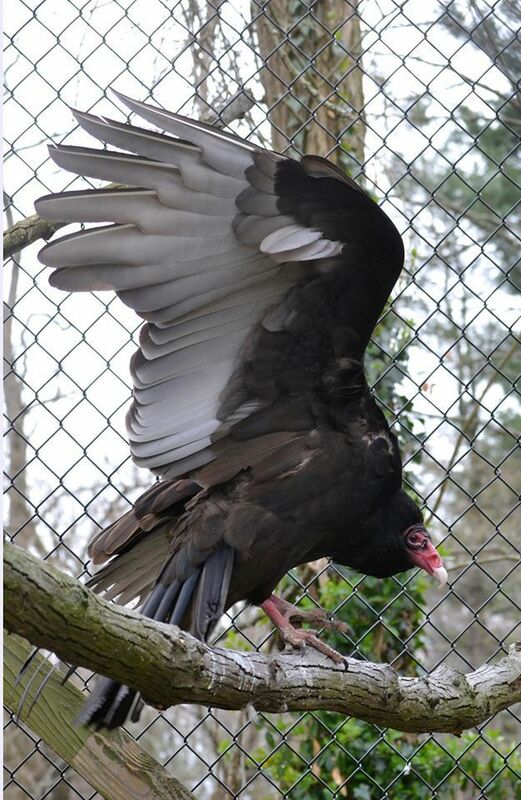 A Long Island sanctuary had been searching for a friend for its injured turkey vulture for the past two years. Turkey vultures live in groups or “venues,” sometimes numbering up to a hundred individuals, and are happiest when they can roost with others. We immediately took our patient out to Sweetbriar Nature Center and thought ourselves lucky that our vulture could live out the rest of his life in peace with company. But the story doesn’t end there. 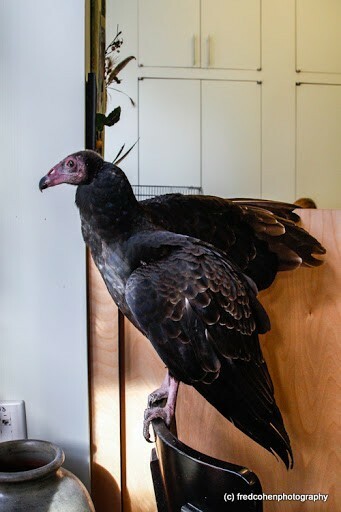 After more than a year of living at the sanctuary, the Turkey Vulture’s enclosure was due for a renovation, so he was temporarily moved into the flight cage, one of the only cages in Long Island big enough to accommodate his six-foot wingspan. To everyone’s amazement, he began to fly! The vulture spent hours soaring back and forth along the length of the flight cage, and soon was flying loops. 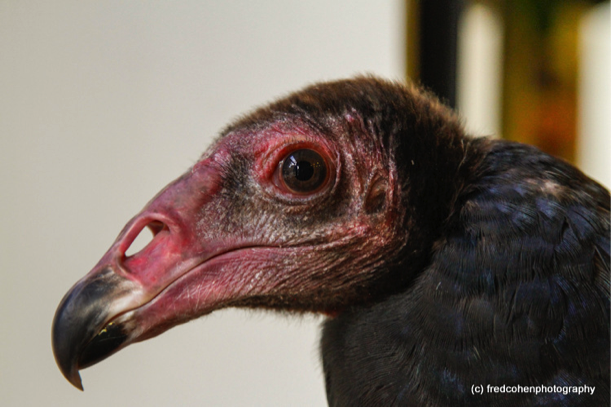 If the sanctuary could just find a vulture venue to release him with, he would be able to go back to the wild almost two years after Hurricane Sandy. It seems that news travels fast. One morning a venue of wild Turkey Vultures landed right on top of the flight cage, as if they had come expressly to pick up their missing friend. The sanctuary staff quickly opened the trap door at the top of the enclosure, and watched as their newly-flying Vulture flew up through the opening and out into the trees. The venue waited only a moment, and then with a loud flapping of wings, flew off together.